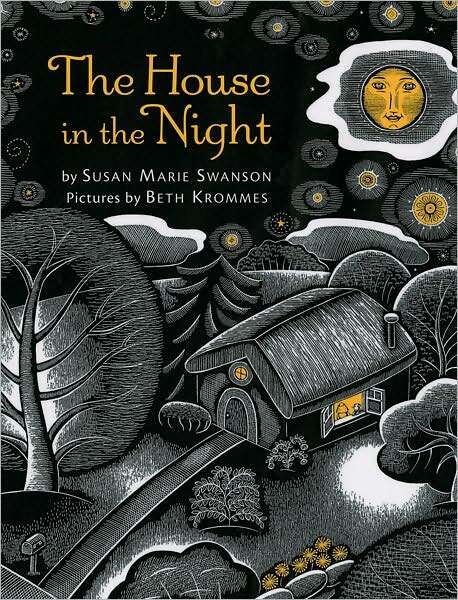 The House in the Night by Susan Marie Swanson. Illustrated by Beth Krommes. That said, I do really like the illustrations. They remind me of those art projects where you cover a page with India ink and scratch away an image. It’s particularly impressive that Beth Krommes was able to make meaningful imagery from the fairly meaningless, or at least vague, text. A good story to read to a little kid, maybe two to four years old. They will appreciate the cadence of the words and appreciate the striking images. 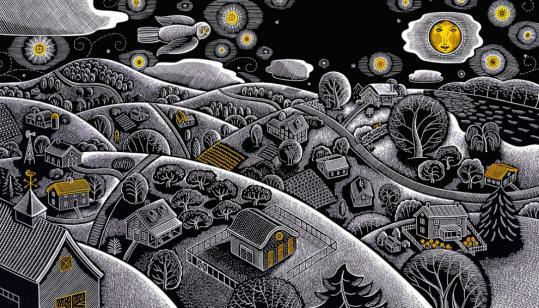 Another gorgeous and beautifully animated movie for the whole family comes to us courtesy of Tomm Moore. If you don’t know the name, he is behind the movie The Secret of Kells, a visually arresting animated movie about a young boy living long ago in the Monastery of Kells in a scary, beautiful, magical world. I could watch it over and over just for the beauty of the animation. His newest movie, Song of the Sea, was nominated for best animated picture last year, for what it’s worth. Taking on Irish legend, the movie tells the story of a boy named Ben and his little sister Saoirse, who is mute. They live alone at a remote lighthouse with their father. One day Saoirse finds her mother’s sealskin cloak in a trunk and puts it on, then runs out to the sea. She dives in and is immediately transformed into a seal. She is a Selkie, one of they mythical creatures who can shed their seal skin and become human for brief periods of time. When her father finds her cold and shivering on the shore the next day, he locks up the cloak and sends the children to their grandmother. But Saoirse has a shell flute from her mother and its song alerts faeries, both good and bad, to her presence. Soon it becomes clear that Saoirse is unwell and must don the sealskin cloak to survive. Good big brother Bed stops at nothing to keep her sister safe and save the faerie folk from the wicked Macha and her owls who turn them to stone. This movie is full of so much and yet it never gets muddled or confusing. 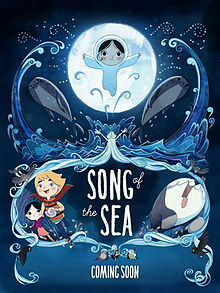 Half tale of lore, half tale of love of a boy for his sister, Song of the Sea is a lovely and beautiful movie to watch as a family. Watch it in bed and you’ll have the loveliest dreams. I’m always on the lookout for a good, new restaurant, and happily, my husband, Kevin, is always on board. So when a homey new BYOB Italian storefront recently popped up, we promptly made a reservation after learning that the chef makes only fresh pasta, uses handed-down recipes from the old country, and is a CIA alum. The interior was clean and welcoming, the wait staff cordial and professional. 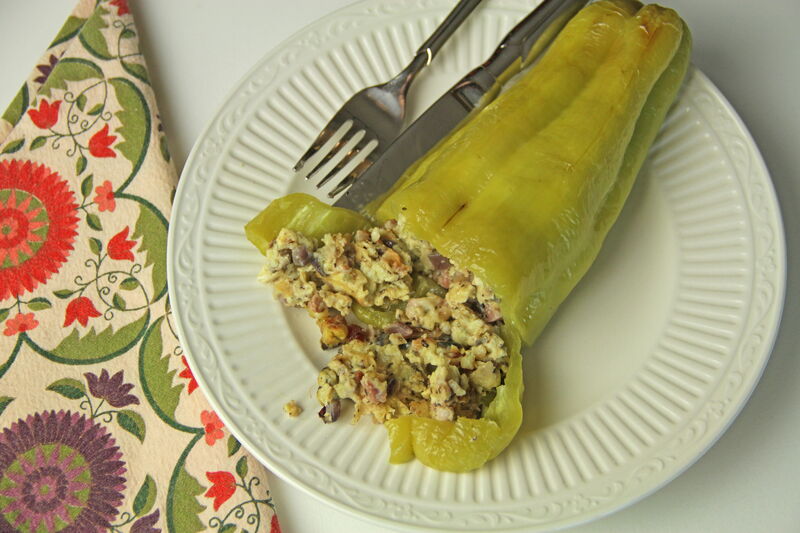 A daily specials menu featured an exciting appetizer of stuffed Italian frying peppers. When a trio of cubanelles was brought to our table, lightly charred and neatly lined up, I began to salivate. Then, Kevin and I each took our first bite, and our expectations were dashed. They were burning hot on the outside, yet cold in the center (heated in the microwave???). The stuffing was bland and over-bready. “These could be so much better,” I said. So I went home and began to experiment, using a stuffing of sautéed Italian sweet and spicy sausages, just a touch of breadcrumbs and parmesan, and a heavy hand with the seasoning. Cooking the stuffed peppers in a lidded foil pan on the grill seemed the logical next step. The results were delicious – an instant success of an appetizer. 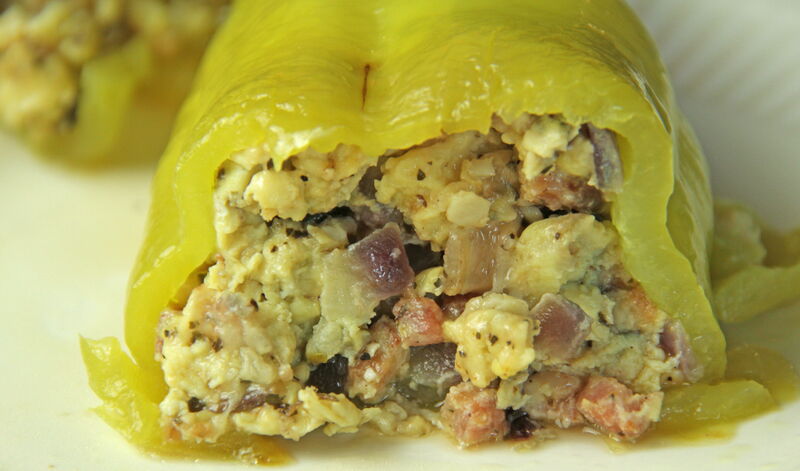 A few modifications – pancetta instead of Italian sausage, no breading at all, and a couple of scrambled eggs – turns these lovely peppers into an instant success of a breakfast in bed that will keep your expectations intact. Preheat oven to 375º. Clean and core Italian frying pepper by cutting a circle around the stem and removing inner seeds. Remove as much of the ribs as possible with your fingers, and give the pepper a good shake to free any remaining seeds. Set pepper aside. Heat 1 teaspoon of olive oil in small pan over medium heat. Add pancetta, and cook for a minute or two, until it begins to render. 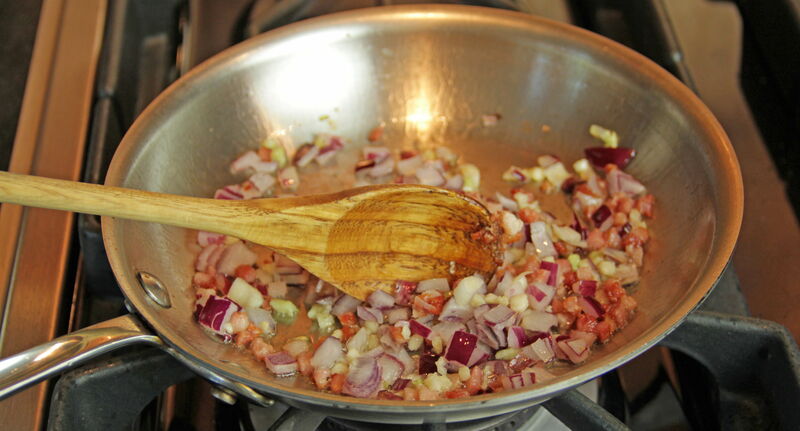 Stir in onion (or shallot) and garlic. Sautee for another minute until softened. 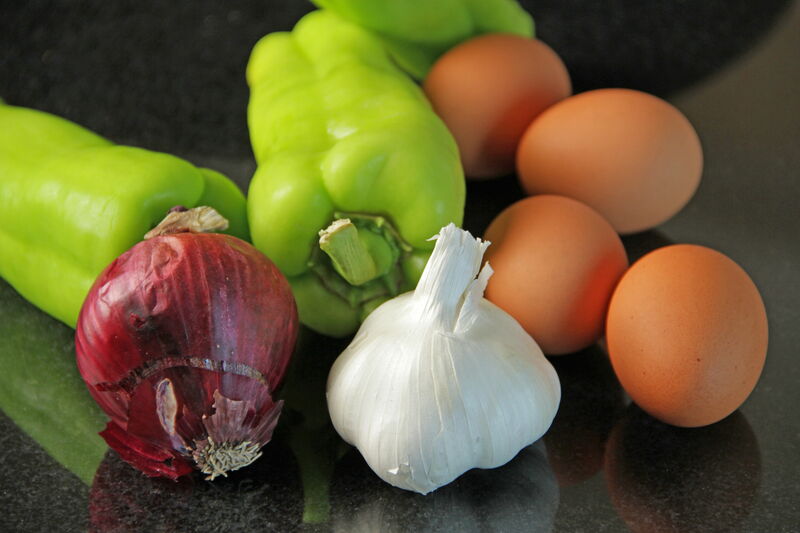 Reduce heat to low and add beaten eggs. Stir and lift, cooking until eggs are fully cooked, about 2 minutes more. Remove from heat and stir in parmesan cheese, Italian seasoning, and salt and pepper to taste. 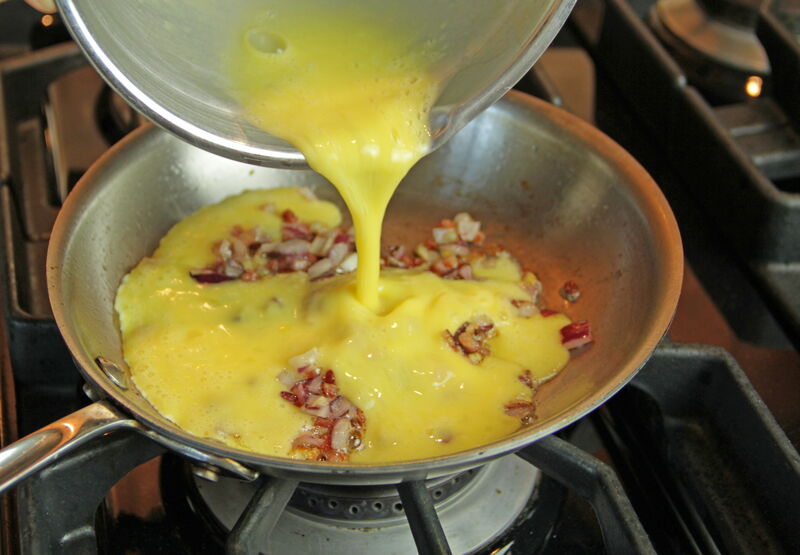 Fill the pepper with the scrambled egg / pancetta mixture, tapping down a little on the work surface to fill completely. Rub the outer skin of the pepper with the remaining olive oil and bake for around 40 minutes, until pepper is cooked and lightly browned in spots. Serve hot. 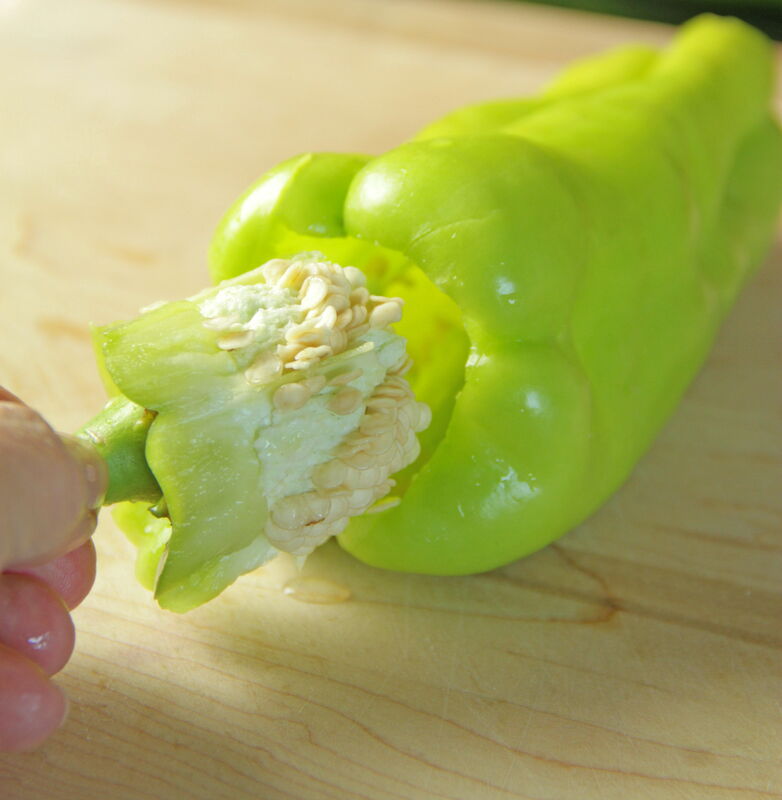 NOTE: Peppers can be stuffed one day in advance, then baked when ready. 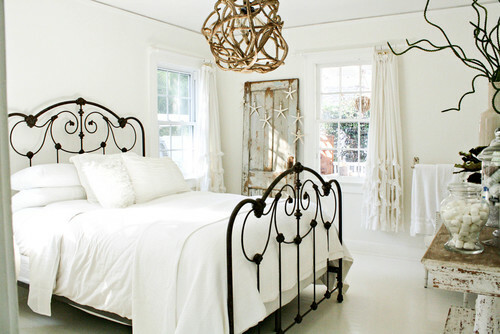 Cottages can be rustic or posh, charming or roomy. They can be decorated in crisp, colorful chintz or draped in sumptuous white linen. 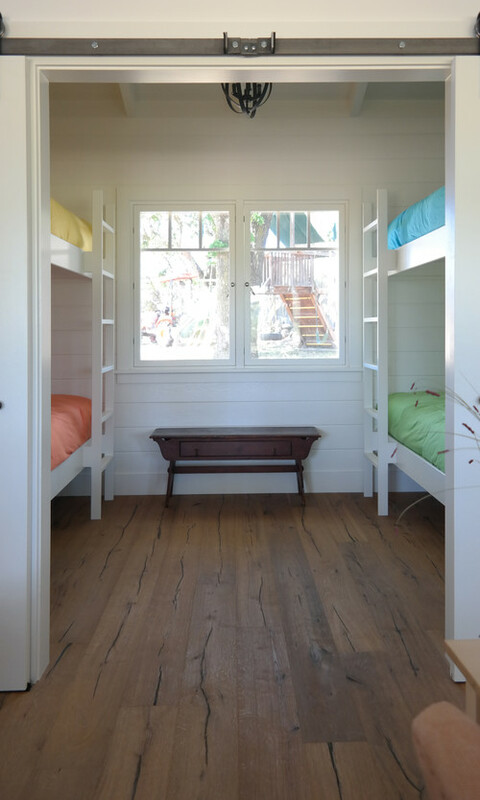 Most have hardwood floors, and some come with board and batten walls. Cottages can overlook a sandy coastline or be nestled deep in the woods. 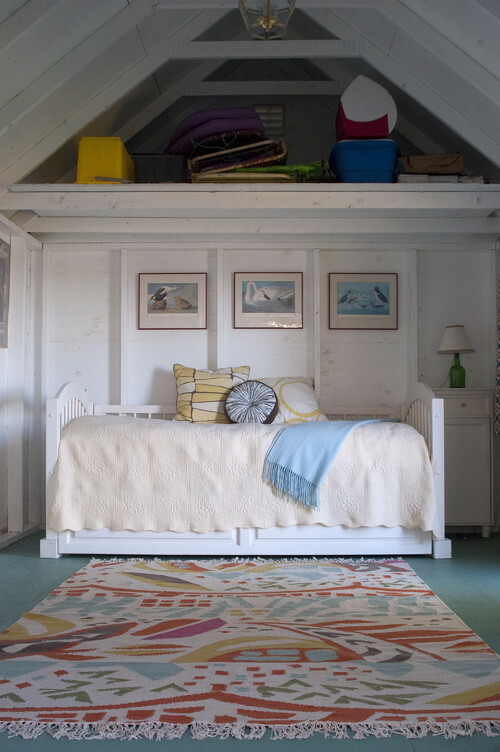 I’ve stayed in several beach cottages over the years, some practically primitive in design and amenities, and others offered every imaginable modern convenience. I adore them all. 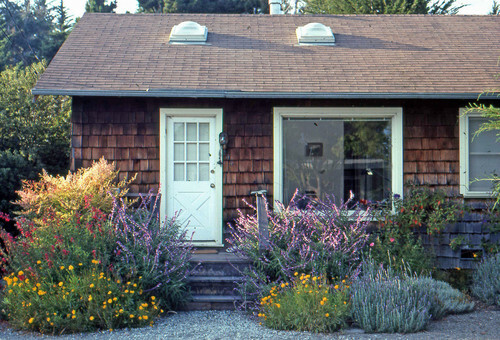 Although I live in a small city apartment, if I’m dreaming of a home in my future, it’s a cottage. When I did a search for unique cottage bedrooms, I found too many to count, but these are a handful of the most interesting rooms I’ve found. This all-white 1940s bayside cottage in Tampa once donned brown carpeting and pink walls. Thank goodness for paint! The bold chandelier makes a design statement. Cleverly designed, this simple bedroom introduces four colors through the bedding. Clearly, this room is for sleeping only. What’s not to love in this modern Philadelphia cottage? From the color combination to the use of pattern and beautiful, natural light, this room wins all around. Maine might be considered the quintessential cottage state. This quaint Portland bedroom is rustic in every sense, and the open storage alcove adds to the room’s charm. 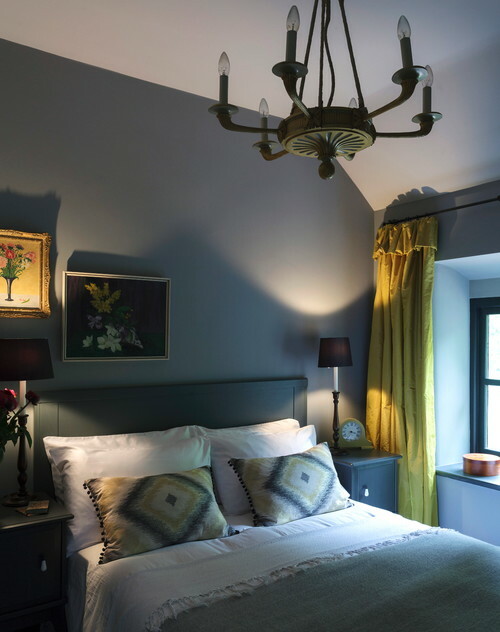 Renovated to look and feel old, this cozy cottage uses black throughout –– often an unlikely color choice in smaller spaces, but it works nicely in this home. “The Golden Pot” by E.T.A. Hoffmann. Nothing makes me happier than the arrival of fall. I love the change of the leaves, the milder temperatures, darkening evenings and the slow creep of Halloween onto the scene. Many years ago, I spent the most influential autumn of my life studying 19th-century German literature, art, philosophy, and music. I spent the days sipping chai amongst the swirling autumn leaves, listening to Robert Schumann and Brahms, reading the tales of the brothers Grimm as well as the modern fairy tales of the 19th century; notably, Ludwig Tieck and E.T.A. Hoffmann. Although the name Hoffmann may seem unfamiliar to you, gentle reader, his best-known book is known to us all. A little story he wrote called “The Nutcracker” has become the seminal Holiday ballet. I must admit, I haven’t actually read that story. Maybe this year I finally will. But his novella “The Golden Pot” is hands-down one of my favorite stories of all time. It’s weird, it’s eerie, and wonderfully magical. The story revolves around a young scholar named Anselmus who is trying his best to be an upright, well-mannered gentleman of Dresden but his flights of fancy and awkward manner get in his way. But when a colleague recommends him to an eccentric old man seeking someone to transcribe a document, his live changes forever. The strange man, the Archivarius Lindhorst, is looking for a man just like Anselmus: his head-in-the-clouds approach to life and his daydreaming are key tools in performing the tasks Archivarius Lindhorst demands. With his guidance, Anselmus finds all his suspicions to be proven true. As Hoffmann tells us, this fairy region of wonder and horror is right before our eyes, if we are willing to look. In this fairy region Anselmus finds love and danger. 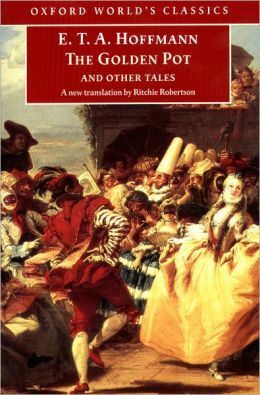 It’s a beautifully odd story, a depiction of the battle between rationalism and Romantacism. He’s team Romanticism all the way. So am I. A great read for a blustery autumn evening.